Leonard Crocker met with Hayley Rolfe, who was the stranger who’d helped him after his heart attack. MONMOUTH — Leonard Crocker’s guardian angel arrived in white nursing scrubs. Climbing out of her car at the Monmouth Public Works garage, Hayley Rolfe heaved a sigh and braced herself for the attention focused on her. She insists that what she did when she stopped to assist Crocker after he had a major heart attack on the side of the road was really nothing at all. What mattered was that she stopped, Crocker told her after a hug. 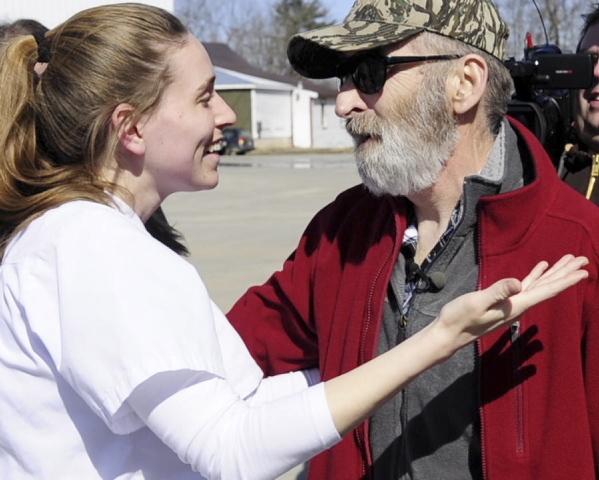 Rolfe’s sister arranged Friday’s meeting between Crocker and the mysterious stranger who may have helped save his life March 17, when he collapsed as he and a Public Works crew were finishing their work cutting trees along Macomber Road. Crocker wanted to thank the woman, but no one knew her name, and he still can’t remember anything that happened before he was loaded into an ambulance. Rolfe was surprised when she learned through the media that Crocker was trying to find her, but she could relate to his feelings. Her late husband had received a bone marrow transplant while being treated for the leukemia that ultimately killed him in February 2010. Rolfe, 28, is about to graduate from Central Maine Community College with an associate degree in nursing. She said that if school hadn’t been out when Crocker had his heart attack, she probably would have been in the unit where he was treated at Central Maine Medical Center in Lewiston, doing her clinical training. Instead, she was driving to her home in Monmouth after shopping at the Winthrop Hannaford with her boyfriend and their two children. She spotted an older man lying on the ground and pulled over. Crocker’s coworker’s said they were calling 911. Rolfe grabbed a stethoscope from her car and went through the checklist she’s learned for evaluating a person’s condition. Crocker, 61, was unresponsive, but he was breathing and had a pulse in his wrists. She noticed he was sweaty and confirmed with his coworkers that he had diabetes. Based on that, she thought a heart attack was probable. Eventually Crocker came to. He said he wasn’t in any pain and wanted to get up, but Rolfe kept him where he was until the Winthrop ambulance arrived. She told the ambulance crew everything she’d learned and then went home to put away her groceries. “I understand the gratitude and everything, and wanting to say thank you to somebody who has helped you, but I really didn’t do anything,” Rolfe said. Crocker said she shouldn’t be as humble about the situation as she is. “She did what she should, and she’s a credit to the nursing profession,” he said. Crocker had never had heart trouble before, but at the hospital he had a procedure to open five clogged arteries and was fitted with a pacemaker when his heart stopped beating three times. He’s recovering well and is itching to return to work. Unused to sitting around with nothing to do, he’s walking two or more hours every day. Rolfe said her classmates are teasing her about her hero status. She was happy to meet Crocker, but she also said she’ll be glad to move past the incident so she can focus on everything she has to do before graduating on May 15. Rolfe plans to continue on to a bachelor’s and a master’s degree, aiming to work as a nurse practitioner in oncology. She was inspired to pursue that path after caring for her late husband. Now caring for others is in her bones, part of her life. Not stopping to help Crocker was never an option for her.